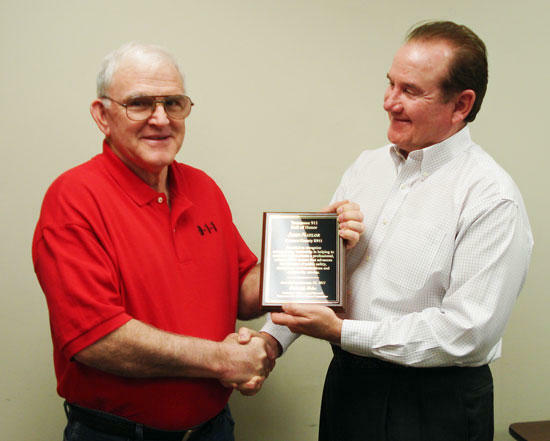 Presenting Chairman Naylor, left, with his award is 911 legal counsel Mike Mahn. Mr. Naylor was cited for leadership in facilitating countywide emergency communications through the 911 Center now managed by the 911 District under an agreement with the County and the City of Woodbury. "911 communications in Cannon County has significantly improved in professionalism and capability under Mr. Naylor's leadership," said Mr. Chris Masiongale, President of the Tennessee Emergency Number Association (TENA), who participated in the induction ceremony. "John Naylor's ability to bring together local elected officials and leaders of all emergency services, has resulted in these achievements. He deserves recognition as a member of the 911 Hall of Honor," the TENA President added. In accepting the honor, Mr. Naylor gave credit to former members of the 911 Board, and those currently serving, including James Adkins, Anna Pittman, Ricky Cope, Brenda Phillips, Micheal George, Roger Turney, Todd Hollandsworth, and Anthony Young. "Each plays an active role in managing the Board and overseeing the relationship between the local governments and the District, and insuring that the latest technology and 911 equipment is provided to the 911 Center," he said. Mr. Naylor also credited County and City Mayors, Commissioners, the Sheriff, Police Chief, EMS Director, and Chiefs of Fire Departments. He praised 911 Director Roy Sullivan and his outstanding professional dispatching staff that manages emergency communications. "They are the team that brings everything together to respond to our citizens in times of emergency," he said. Congratulations John! This is an honor most deservedly earned. Thank you for all your effort in bringing our county up to such a significant standard. Congrats John, you have earned it!